If you want to learn how to cook pot roast so it's deliciously tender and juicy every time, it helps to have tips and a little guidance to set you on the right path. Facing a big chunk of meat can be intimidating and cooking it the right way is one of the biggest kitchen challenges. Common cuts used for pot roast include chuck, brisket, top round, bottom round, and rump. You can always ask the butcher in your supermarket for help selecting a cut for pot roast. Leaner roasts such as rump, chuck, or brisket have less fat marbling, so they can become chewy if not cooked correctly. It is the fat and connective tissue in the roast that is softened by long, slow cooking to produce flavor and tenderness. But you can still get tender meat from leaner roasts by braising, which is cooking them in a small amount of liquid in a covered pot for a long time over low heat. Always buy more meat than you think you will need. Leftover pot roast makes for some tasty sandwiches the next day. Generally, you will get two to three servings out of a pound of boneless roast, and two servings from a pound of bone-in roast. If your grandmother used to cook a delicious pot roast, and you are wondering how use these general tips on how to make the perfect pot roast. The cuts of meat used for pot roast have less fat than steaks and long, slow cooking with liquid (braising) tenderizes the meat fibers. There are several ways to achieve moist heat, including on the stovetop or in the oven in a covered pot, or in a slow cooker. Alternatively, pressure cooking with a traditional pressure cooker or instant pot will also braise the meat but in far less time. Browning the roast on all sides before braising or pressure cooking will seal in the flavor. First, season the meat with salt, pepper, and other spices such as Cajun seasoning or marjoram and thyme. You may also dust the roast in flour or cornstarch before browning. In a frying pan, heat oil on high heat. Add the meat and cook each side in the oil until it is browned. This will take eight to 10 minutes, so be sure to budget for your time. Browning improves the flavor and appearance of the meat. The high heat used during browning caramelizes the sugars and proteins in the meat, which results in a rich flavor. If the recipe does not call for browning, you do not have to worry about it (but you might want to try it anyway). You can usually get the best results by baking the roast in the oven or using a slow cooker. When the pot roast is simmered in a skillet on the stovetop, you have to pay much more attention to the cooking process. One of the best things about a pot roast in the oven or crockpot is that you can set it and walk away. When you braise the meat, you can use anything from cola to beef broth to tomato juice. 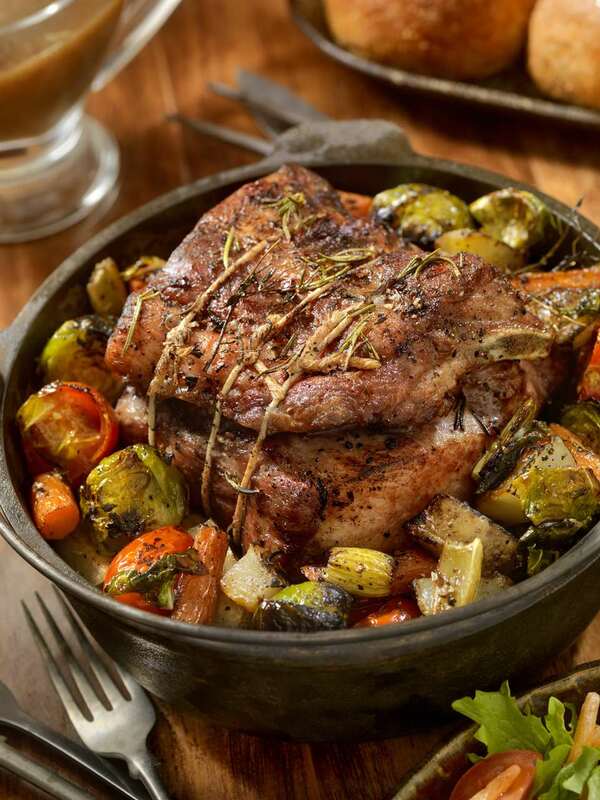 Browse different pot roast recipes for ideas on what to use as your braising liquid. Aromatics such as sauteed onions or garlic are often included in the braising liquid. Add vegetables to the meat and you have a complete one-pot meal. Potatoes, carrots, onions, and mushrooms are typical additions, but you can get creative. Vegetables should be added right at the beginning when you are cooking in the crockpot. For oven pot roast, add vegetables about one hour before the meat is done. For the quickest preparation, go with pressure cooker pot roast—you can have a pot roast in just about an hour. In the oven, you might need 2.5 to 5 hours, depending on the size of the roast. For a slow cooker pot roast dinner, it's best to start in the morning to have the roast ready for the evening meal. Undercooked pot roast will be tough and chewy. Test your roast with a fork before you remove it from the pot. If it is done, the fork will go in easily and you'll be able to twist off a forkful of meat. It if is still firm, return the roast to the pot and continue cooking for another hour. Another problem is overcooking the pot roast, leading to dry meat. Prevent this by ensuring you have enough braising liquid in the pot and don't let it go dry. For smaller roasts under 3 pounds, check for doneness at two hours. For larger roasts, check three hours.